Have you ever had the feeling that you have dozens of cookbooks, a fridge full of food but you're just not sure what to cook? I don't get that feeling very often, but when I do I always go back to an old favorite. 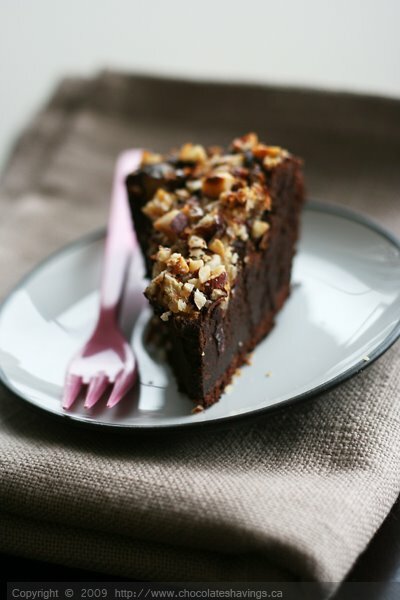 Flourless chocolate cakes are a classic.. but hyped up with fruit and nuts they are just amazing. The combination of apples, hazelnuts and chocolate was what drew me to this recipe and all I can say is.. I was rewarded by my curiosity! Chocolate and apples are less seen in daily desserts but they go wonderfully well together. Add the crunchiness of some chopped hazelnuts and you have yourself quite the dessert. This cake was easy to make (think 20 minutes preparation maximum) and was an easy way to switch up a basic recipe. Preheat your oven to 375ºF / 190ºC. Prepare an 8-inch or 9-inch springform pan (at least 2 inches deep) and grease the bottom and the sides. Peel, core, and slice the apples into 1/2-inch dice and set aside. In a small saucepan, bring the heavy cream to a light boil. Chop the chocolate and place in a bowl. Pour the cream over the chocolate and let cool for about a minute. Using a rubber spatula, mix until the chocolate and cream are homogeneous. Slowly mix in the egg yolks and cornstarch until thoroughly incorporated. The mixture will be smooth and slightly thick. In a separate bowl, add the honey to the egg whites and whip until soft peaks form. Using a whisk, add about 1/3 of the whipped egg whites to the chocolate mixture to lighten the mixture. Don't worry about breaking the whites at this point, just whisk in the whites to make the batter more malleable. Then, gently fold in the remaining egg whites in two batches, and avoid over-mixing. White streaks of egg white should still be visible in the chocolate mixture. Pour the batter into the greased springform pan. Top with the chopped apples and hazelnuts and dust lightly with confectioner's sugar. Place the springform pan on a cookie sheet or sheet pan and bake immediately. Cook for 30 to 35 minutes or until a wooden skewer inserted in the middle of the cake comes out clean. Be careful not to overcook or the cake will become flaky and dry. Let the cake cool in the springform pan for at least 15 minutes before unmolding. The cake is best enjoyed while still warm. Enjoy! WOW - I love the idea of adding apples to a rich flourless chocolate cake -- sounds divine! And the picture is gorgeous too. What an interesting combination of ingredients, I never would have thought to put them all together. This cake looks wonderful; the texture is luscious! Wow, an interesting combination. It looks absolutely delicious. What a great combination of flavours. I have a friend who's a coeliac, this cake will be perfect for her birthday. I feel that all the time! You found a beautiful solution - what a delicious combo of flavors! What a delicious combination of ingredients! That cake looks so chocolaty and good! Wowo they just look so beautiful and so so delicious. This looks so good! I would have never thought to put that combination of ingredients together, but it sounds delicious! Sounds like a perfect and delicious gluten free cake. Must try. That's a serious looking cake. Dense & rich. My children hate to eat the same thing more than once every 3 weeks. And they don't like anything out of a box, can, or pre-frozen!!! You know all the stuff normal kids love?! They are HIGH maintenance! wow...looks amazing. i'm going to make it for my man for Valentines Day!! <3 Thanks for the idea!! What wouldn't I do for a piece of that right now?! oh so gorgeous!! Looks so chocolatey, moist and delicious! Beautiful photo, and I can only imagine how rich and lovely this tastes. Thanks for sharing! Were you (by any chance)reading my mind when you wrote tha first sentence? The answer is yes, and yes, and if I had known about this recipe before today it would have become one of the ones I'd come back to! Chocolate and apples are such an unusual combination - but one look at your pictures, and I'm ready to go for it! YUM! Chocolate and apples?? I'm in! Yum, a delicious decadent chocolaty treat! I love the apples in this cake. What a great combination of flavors. this cake looks delicious. what a unique and delicious combination! can't wait to try it. Looks intense! Where do you buy your Valrhona?? This cake looks absolutely delicious! Can't wait to make it. Lots of flavors in this cake. I love them all! very nice looking cake, the flavour definitely amazing. your blog is very interesting and have plenty of amazing recipes. I would have never thought to add apples to the cake..it looks so thick and delish! ooooh! decadent! flourless is the way to go in my book! That looks absolutely delicious. Never heard of the combo of chocolate cake with apples but it sounds great to me! This look great. What a combo. Thanks. Well...hello, delicious. I'll bet it's so decadently, perfectly, chocolate-ly moist and delicious! I love the combination of textures and flavors here. Oh my, this wedge is deep, dark chocolatey goodness. No need for seconds here. holy moly this sounds awesome! This sounds like an interesting combo! Looks wonderful! This cake looks so good. I will definitely make it with some tweaks (can't have honey). The combo of apples and chocolate sounds divine! Such a unique, yet delicious combination of ingredients! So lovely! I made this last night, very tasty and well liked by my guests. It wasn't as dense as I was expecting, and it also took about 50 min of baking time. It paired quite nicely with a little vanilla bean ice cream. jeff: I'm glad you liked it! And I agree, although it's a pretty chocolate-heavy cake it isn't too dense. I love flourless chocolate cake and I can imagine that the combo of hazlenuts and apples balances out the rich flavors nicely. And your photos are fabulous- I love your blog and I'll definitely be stopping back! I just made this and I too found that I had to cook it for longer - a great chocolate cake for those who prefer lighter cakes that aren't heavy on the chocolate. Lovely blog, I come here for inspiration often. Thanks for nice photos and beautiful blog. I baked this last nite and it took 65 minutes. It tastes really great. I like it when it's completely chilled out in the fridge. Althought it hardens a bit that way, but it's still fork tender and melts in your mouth ! Terrific!. I also love the apple bits. The pieces that cooked through inside the cake is soft and sweet. Yum. hey! Can you explain the reason why you add the egg whites separately and make sure they have peaks with the honey? Is it for texture? Anonymous: Yes, it's to make sure they are airy to lighten up the mixture! Woops! That was me. Appreciate the response. I have an awful lot of apple sauce in my fridge...I wonder if I can work that in here instead of the actual apples without making it goopy? Erin: I would really try to use freshly chopped apples for this recipe. The apples are the finishing touch on touch of the cake, so they're not really meant to mess with the actual texture of the cake! When I first saw this recipe and the photos, they tempted me to try it. The result was worth trying and tasting this wonderful combination of chocolate and apples!